The genus has about 30 species round the world The best known of these is the house sparrow, Passer domesticus. The house sparrow was introduced deliberately to America in the late 19th century. It was imported by several people, including Eugene Schieffelin, who was a wealthy New York City admirer of Shakespeare. He wanted to introduce to America all the birds mentioned in the works of Shakespeare. Two of these species were great successes: starlings and house sparrows. He organized a society for the importation of foreign birds, incorporated in Albany. Some scientists believe that the Estrildid finches are in the same family as sparrows. but they are now in a different family; the Estrildidae. The 'hedge sparrow' (also known as the dunnock) Prunella modularis is also not a true sparrow. 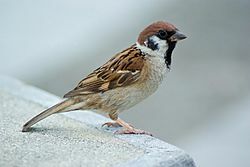 It is only called a sparrow because a long time ago, people called all small, brown birds 'sparrows'. This name is still used today because it is a tradition. Sparrow Facts for Kids. Kiddle Encyclopedia.